Here we go again, awesome premium WordPress theme giveaway again. This time, we giveaway a theme called Eptonic with built-in all time famous content composer. It's the same author from Brainstorm and Someday WordPress Themes. This minimalistic theme can be used for any kind of website. It can be used for a business website, as a portfolio or a blog because it's super easy to customize. It includes the Content Composer with 8 modules with even more options so you have total freedom of managing your content. It has some great features for your normal pages, blog and portfolio pages. Make unique sidebars per page, choose between two different sliders, use the custom widgets special made for this theme, have a stylish blog and show off your work the fancy way. Congratulation! 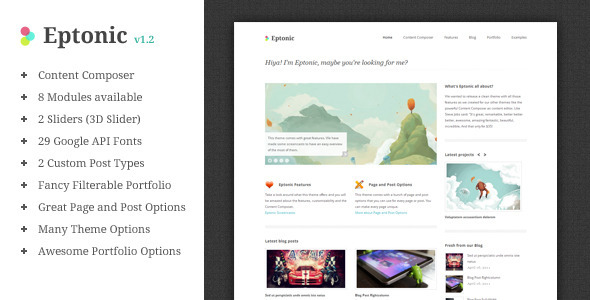 You have won a copy of awesome Eptonic WordPress Theme! You should receive an email soon, otherwise, please use our contact page to let us know. Count me in for the contest! Thanks. Hiya, nice setup, I look forward working with it. Nice & good Theme. I used updated my site & I win this. Thanks for giving away such a great theme. Hey, just came across your site from a post on twitter about an AJAX form and started looking around -- love the content!